But no ant could direct another, even if they wanted to. Ants are incredibly simple creatures. They have limited cognition, and extremely basic, binary communication based on chemical signals. No ant is capable of assessing the global view of the colony. They are not able to engage in any kind of collective planning. Yet despite these limitations, collectively as a colony, ants are capable of staggeringly sophisticated feats of problem solving. For example, ants can ensure that their midden (rubbish dump) is equidistant between the nest entrance and the food store. They adapt rapidly to changing conditions like sudden availability of food, or environmental disturbance. Their nests balance solar collection and ventilation to thermoregulate. They can even produce near perfect solutions to NP-hard problems like the travelling salesman problem, in which they find the optimal foraging route using the minimum time and effort. The reason this is possible is because of the way ant societies are organized. These amazing capabilities are emergent properties of a system of simple rules which determine how individual ants, responding to local stimuli, behave in any given situation. 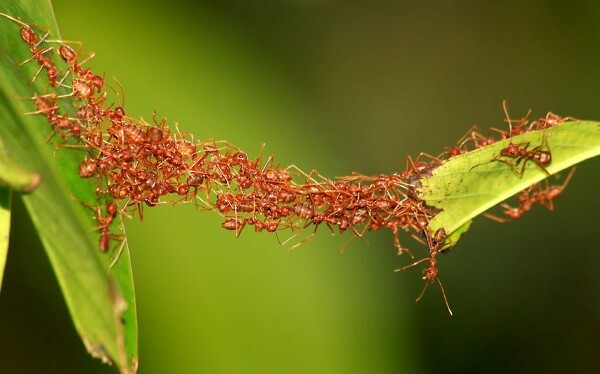 Ant colonies are an example of a complex adaptive system: dynamic networks of interaction between nodes which react and adapt to stimuli from each other and their environment. These kinds of networks are characterised by simple local rules, from which emerge collective behaviour and self organisation of the system as a whole. As human organisations, we have to address all the same kinds of problems ants do, but our activities are rather more varied and complex. In response we have devised sophisticated approaches to overcome the problems of cognition, coordination and cooperation posed by collective action. Hierarchy, in the form of monarchies, militaries and religions has existed as the dominant form of human organisation for thousands of years; but it wasn’t until the industrial revolution that we saw companies as we now understand them emerge and produce at scale. Corporate hierarchies allow us to overcome problems like division of labour, coordination, and quality control. They also provide an alternative to the market-price mechanism for labour. Companies increase in size once they reach a threshold where it is more cost effective to employ someone to be available all the time, than to pay an outworker to do exactly what is required when factoring the ‘transaction cost’ of finding and managing those suppliers. In an ideal world, people would ascend the hierarchy because people higher up identify their quality and modulate their influence on the basis of merit. So, in hierarchical organisations, management strata should obey a power law distribution in strict order of competence. Primacy often comes to the most dominant, vociferous or politically savvy candidates, rather than the most capable. Bottlenecks and single points of failure are key characteristics of hierarchies. Politics, conformity pressure, groupthink and multifarious biases jeopardise effective management and decision making. As companies scale, it takes longer for information to travel up and down the chains of command, for decisions to be made and ideas implemented. This lack of agility makes them struggle to adapt to changing market conditions, and is ultimately why incumbents get disrupted by faster moving, more responsive upstarts. These problems are increasingly recognised, and many organisations are applying more progressive approaches to governance. Holacracy is one used in firms like Zappos and Medium with some success. Yet while many agree that it succeeds in distributing authority and allowing organisations to move faster, they also complain that it is too complex and dogmatic. It requires extensive training, a thick manual and expensive proprietary software. Others still, like Spotify and Valve have developed their own homegrown approaches. On the other side of the equation, as a worker it was once optimal to find a job and then work at that company until retirement. As the jobs market became more fluid, it became increasingly common to change employers several times during your career. Now we are seeing a rapid growth in self employment. Already 30% of the US workforce consider themselves freelance, and that figure is predicted to increase to as high as 50% within the next five years. More people than ever are starting companies, and opportunities to earn a living while retaining independence are proliferating. Skilled knowledge workers can easily find clients on Upwork, makers have instant access to customers via Etsy, and drivers once beholden to restrictive contracts have the flexibility to receive work simply by opening Uber. These new kinds of platforms are network marketplaces which facilitate transactions between supplier and customer. Whereas before it was impossible for a company to manage relationships with many suppliers without linearly scaling employees to manage them, now software mediates these relationships and the (previously prohibitive) transaction costs tend to zero. Such a trend is not without limitations. For firms, freelance workers are at liberty to work with whatever competition they please and their availability cannot be relied upon. Workers in the ‘On Demand’ economy have no job security and no benefits like insurance or options schemes. This trade off is often worth it for the flexibility and higher earnings that freelancing affords, but earnings are inextricably linked to hours worked. In parallel, another technology emerged and solved the problems of organisation in a very different way. Bitcoin ‘employs’ thousands of computer users (miners), whose systems perform the work of validating transactions and securing the network. In return for this effort, the network pays out a reward of 25 bitcoin (worth around $6000) roughly every ten minutes. Like ‘On Demand’ platforms, the Bitcoin network enjoys zero transaction cost in engaging a distributed, resilient, redundant network of suppliers. However, whereas ‘On Demand’ platforms simply mediate relationships between independent buyers and sellers, the Bitcoin network also means that the ‘organisation’ providing the service (the miners) is also made up of independent individuals with no central control. By providing economic incentives for participation, the protocol solves the problems of coordination and cooperation of a network of discrete self interested individuals. Bitcoin can be seen as the prototypical example of a new organisational paradigm: the ‘Decentralised Autonomous Corporation’. Owned and operated by its workforce, and publicly traded by default, it distributes equity in itself on a constant and ongoing basis in direct proportion to the value each member of its workforce has contributed. Other projects predicated on similar principles are beginning to emerge. Ethereum incentivises computer users to run software programs distributed on its network. Augur, a decentralised prediction market, incentivises a distributed network of users to report on the outcome of events for which markets have been made. These kinds of decentralised platforms do a great job of incentivising the relatively simple, developer defined work systems needs to function sustainably. For the system itself to be built however, the most obvious answer is still the traditional organisation as outlined above. But, we’d argue, not for long. The problem is, talent is highly distributed, but opportunity is highly centralised. Given today’s instantaneous and low cost global communication, it no longer makes sense that we are constrained to the same old centralised hierarchies we’ve tolerated for centuries. In the future, as workers increasingly choose independence over employment, and more people look to start new projects of their own, distributed organisations will become increasingly prevalent. That being the case, either ‘project management’ is going to become a growth industry or in the face of spiralling transaction costs, software is going to eat project management. Platforms will increasingly allow companies to maintain a lean internal staff, and contract most of the roles from a diverse ‘On Demand’ pool of collaborators. Taken one step further, some organisations will not require central control at all. Principles underpinning complex adaptive systems will allow online software mediated organisations to emerge and scale as rapidly as subreddits or facebook groups. By aligning the incentives of the workforce around productivity, people anywhere in the world will be able to build organisations together online without the need for hierarchical management. Therefore, organisations will be able to adapt to changes in their environment instantaneously, rather than awaiting decisions from on high. The members of these organisations will own them proportionate to the value they have contributed, and influence will be a pure consequence of aptitude. That’s the future Colony is building. Over the next few weeks we’ll be talking a lot more about the project, the thinking behind it, our progress to date and plans for the future. We hope you’ll join us. Let’s change the way the world works.